One of the most interesting Facebook groups on Chennai is the Madras Local History group. The thing about history is that all of us never really discover anything at once. Some thing we know for a long time comes as news to somebody else, and what strikes us as a golden discovery would have reams written about it already. But this never really stops us from being fascinated genuinely. One such recent post on the Madras Local History group was on this magical picture. 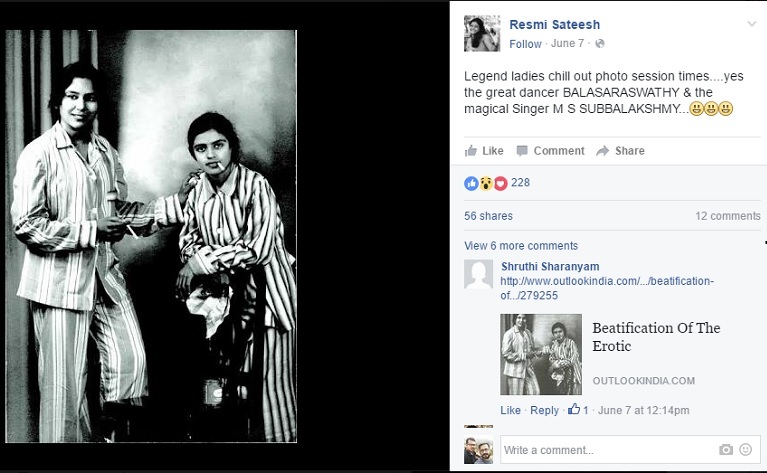 The two girls in the image are Carnatic singer MS Subbulakshmi and dancer Balasaraswati. For an ignorant Chennai boy who grew up looking at MSS as an old-aged singer, conditioned to assume that she would be from the same conservative channels of society as my own grandmother, the image of her holding a cigarette in night-suits and posing for the cameras in a completely chillaxed manner can be quite startling. “This photograph is arresting on so many levels. The year and the image. 1937 and two Indian women dressed in western wear posing with cigarettes. There is also the fact of the unknown photographer as well as the unknown studio where this may have been taken. The blurb points to the background of the two women as coming from quite a conservative background. There would have been time spent in planning this. Finding the photographer who they seem to be quite comfortable with, arranging for clothes, the unsmoked cigarettes. Also knowing that this photograph wouldn’t find its way out. Keeping the print hidden, the excitement of the seeing this image, of a secret. Apparently, the book by Knight has chapters of “quality not witnessed before in scholarship around Indian dancers”, according to Sadanand Menon. That is some endorsement.